NOTE: If you arrived here via a link from a site run by The Garden Seeds, know that I had never heard of them until they linked to this article without my permission. Because they sell seeds, the link to my site makes it appear as if I’m endorsing them as a seed source. I AM NOT ENDORSING THEM. I DON’T KNOW THEM. But, apparently, I can’t stop them from misappropriating my words (they include a huge quote). Sometimes the Blogosphere shows its seedy underbelly, and this was one of those days for me. I’ve only mentioned herbs in passing so far in this blog, but that’s not because I don’t grow them. I love herbs, whether they are traditional culinary plants like Basil, or medicinal/household ones like Soapwort. I find them all endlessly fascinating and diversely gorgeous. I grow as many as I can find room for. One of my favorites is Anise Hyssop (Agastache foeniculum). This perennial wildflower is a native of midwestern US prairies, but it grows quite enthusiastically in my southeastern US Piedmont garden. In fact, this plant self-sows so readily that it is approaching weed status in some parts of my yard. From mid-May to late August, these flowers produce spikes of tiny lavender flowers that attract every pollinator that lives around here. I have some growing among my vegetables to ensure excellent fruit production. Today while I was tying up the tomatoes (some of which are now seven feet tall), I noticed honey bees, bumblebees, mason bees, and at least three other tiny bee species, plus an Eastern Tiger Swallowtail Butterfly all jockeying for a taste of Anise Hyssop nectar. It must be very tasty stuff. In winter, the low basal rosettes of softly scalloped leaves are tinged a bit purple by the cold. At all times of the year, the leaves are strongly anise-scented and flavored. If you like licorice, you’ll love the taste and smell of these leaves. They add interesting nuances to teas and desserts. I love Anise Hyssop for its obliviousness to heat and drought, prolonged bloom time, and imperviousness to deer predation. I guess deer don’t like licorice-flavored leaves. All the pollinators help the plants produce abundant seeds, which are as irresistible to goldfinches and chipping sparrows as the flowers are to pollinators. The bright goldfinches are especially enthusiastic, often breaking seed-laden spikes as they struggle to find every tiny black seed. The feeding frenzy of pollinators and birds animates my landscape, providing movement even on windless days. These perennials self-sow freely, and I have given away probably hundreds of seedlings to gardening friends over the years. Even so, every spring I find myself pulling up and composting quite a number of shallow-rooted seedlings. I hate doing this to such a lovely plant, but I figure they’re still contributing to the garden when they become compost. The other nice thing about these flowers is their form. Their flower spikes blend aesthetically with the other flowers in my garden beds, mingling well with Echinaceas, Daylilies, and Rudbeckias. 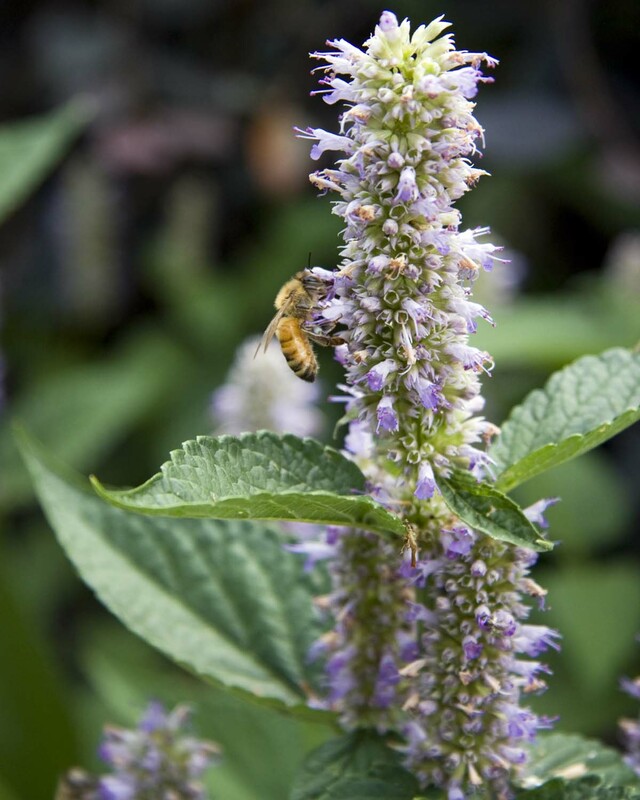 Anise Hyssop is easy to grow from seed; you can also find fancier named cultivars and related Agastache species in different colors at nurseries and in catalogs. 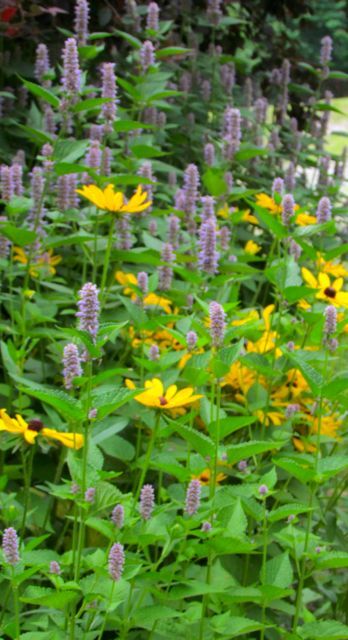 If you’re a Piedmont gardener with a sunny spot in need of prolonged color, give Anise Hyssop a try. I think you’ll be pleased with this lovely lavender pollinator — and native bird — magnet. This entry was posted on June 18, 2011, 4:41 pm and is filed under Favorite Plants, Native Wildlife, piedmont gardening. You can follow any responses to this entry through RSS 2.0. You can leave a response, or trackback from your own site.